Israeli FM says Trump planning to sign order officially recognizing Golan Heights as Israeli territory during meeting with Netanyahu. President Donald Trump will sign an executive order Monday, formally recognizing the Golan Heights as Israeli territory, Israel’s foreign minister said Sunday afternoon. The signing of the executive order on the legal status Golan Heights will take place during President Trump’s meeting with Israeli Prime Minister Binyamin Netanyahu, Foreign Minister Yisrael Katz tweeted Sunday afternoon, adding that the decision signals the continued strengthening of ties between Israel and the US. On Friday, Reuters reported that US officials were preparing an official document to codify recognition by the United States of Israeli sovereignty over the Golan Heights. 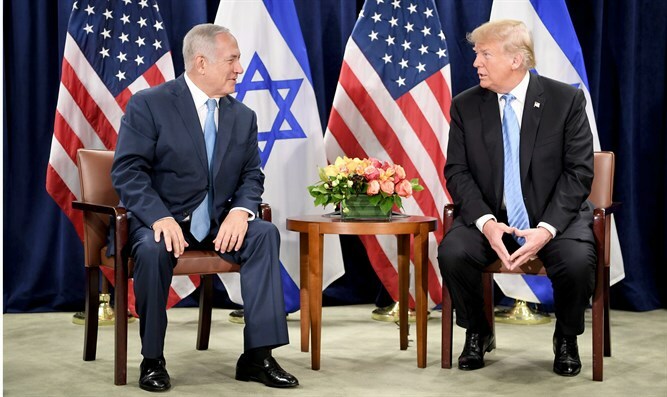 A day earlier, Trump announced in a tweet that he felt the time had come for the US to officially recognize Israel’s annexation of the Golan Heights, ending a decades-old policy of non-recognition. After 52 years it is time for the United States to fully recognize Israel’s Sovereignty over the Golan Heights, which is of critical strategic and security importance to the State of Israel and Regional Stability!" Israel captured the strategic plateau from Syria during the Six Day War in 1967. While Israel surrendered part of the Golan Heights during negotiations with Syria after the 1973 Yom Kippur War, the Jewish state retained roughly two-thirds of the 700 square mile area. The Menachem Begin government applied Israeli law to the Golan Heights in 1981 with the Golan Heights Law, effectively annexing the territory. At the time, the US, Soviet Union, and United Nations refused to recognize the move.